Thousands of deep holes can be drilled through a 600mm tubesheet using a standard machining centre, Nuclear AMRC research has shown. The study could lead to significant savings in manufacturing cost and time for a range of heat exchanger tubesheets and support plates. Typically measuring up to five metres in diameter with over 10,000 deep holes through 600mm of Inconel-clad steel, steam generator tubesheets represent the most demanding application in tubesheet drilling. With a length-to-diameter ratio of over 30, these holes are challenging for standard drilling techniques, particularly given the number of holes that have to be produced with zero faults. 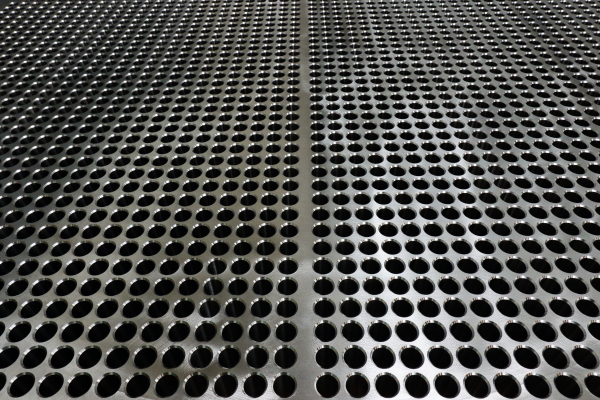 These tubesheets are currently produced on a dedicated gun drilling machine, using a mineral oil lubricant that can present contamination risks to nuclear components, with a long cycle time which can cause bottlenecks. 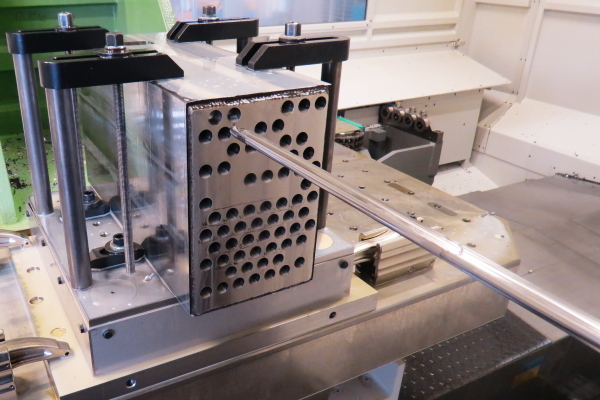 In a project funded by the Nuclear AMRC research board of member companies, the machining team investigated whether these new drills could meet the demands of tubesheet manufacturers. The team used the Starrag Heckert HEC1800, a large high-precision horizontal boring machine, to prove a selection of commercially available drills. Each was used to drill 600mm steel testpieces with Inconel end cladding. The researchers observed machine performance, chip formation and tool wear, then measured the accuracy of the holes with a 150mm CMM probe. Although some of the tested tools could not successfully drill the full depth, the team identified a drill geometry and cutting parameters that produced deep holes of exceptional quality on a standard machine tool platform using off-the-shelf tooling. Importantly, the holes were produced using a standard soluble coolant, allowing higher material removal rates. By saving minutes per hole, machining time for a full tubesheet can be cut by many days. Single-platform machining of tubesheets will allow manufacturers to reduce costs and become more flexible. The technique could be particularly valuable to smaller businesses which will be able to produce a wide range of heat exchanger tubesheets and other components without investing in new machine tools. Full results have been shared with members. Work continues to optimise the drilling process and reduce cycle time, and to improve robustness to meet industry standards. The team are also working with tool suppliers to test and develop new drill designs. For more news on how the Nuclear AMRC is supporting industry through manufacturing R&D and supplier development, download our Q4 newsletter (4MB pdf). 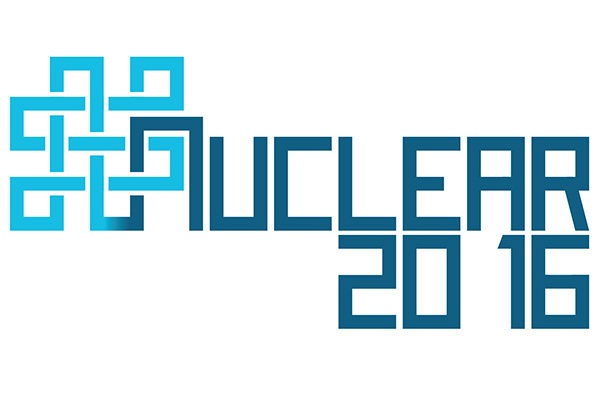 The Nuclear Industry Association’s annual conference, Nuclear 2016, will bring together speakers from all parts of the nuclear industry to discuss key developments in 2016 and look ahead to 2017. With keynote speakers and sessions focusing on nuclear new build, decommissioning, small modular reactors (SMRs), export opportunities and more, the conference offers unrivalled access to the sector’s senior leaders – including Mike Tynan, Nuclear AMRC CEO, who will talk abut the manufacturing challenges and opportunities of SMR development. The Nuclear AMRC is continuing to work with Westinghouse Electric Company to reduce build lead times for the US group’s small modular reactor (SMR). Nuclear AMRC engineers are working with Westinghouse and modular construction specialists from Cammell Laird on a new advanced manufacturing study. The study will explore potential design efficiencies which can reduce costs to customers while promoting growth in manufacturing within the UK. The study follows an initial advanced manufacturing study on the Westinghouse SMR reactor pressure vessel, one of the largest and most demanding parts of any reactor. That study, completed in April 2016, demonstrated that Westinghouse’s design had the potential to be efficiently manufactured in the UK. The new study will focus on how the SMR design can allow for greater production efficiency through modular assembly techniques. Heavy engineering group Cammell Laird has also been engaged by Westinghouse to work on the study. Westinghouse says that the study further demonstrates its commitment to partnering with the UK government to deploy the company’s SMR technology, and move the UK from buyer to global provider of the latest nuclear energy technology. Westinghouse also proposes to manufacture fuel for its SMR at its Springfields site in Lancashire. The Nuclear AMRC’s commitment to supporting women in engineering and research has been recognised with the Athena Swan bronze award. The Athena Swan scheme recognises commitment to advancing the careers of women in science, technology, engineering and related fields at universities and research institutions. The bronze award recognises that an institution has a solid foundation for eliminating gender bias and developing an inclusive culture that values all staff. “I’m absolutely delighted that the people of the Nuclear AMRC have been recognised through the Athena Swan bronze award for their dedication and commitment to providing a working environment that is free from gender bias, recognises the value of the individual, and promotes the unconditional trust and respect needed for true potential to be liberated,” says Mike Tynan, chief executive of the Nuclear AMRC. 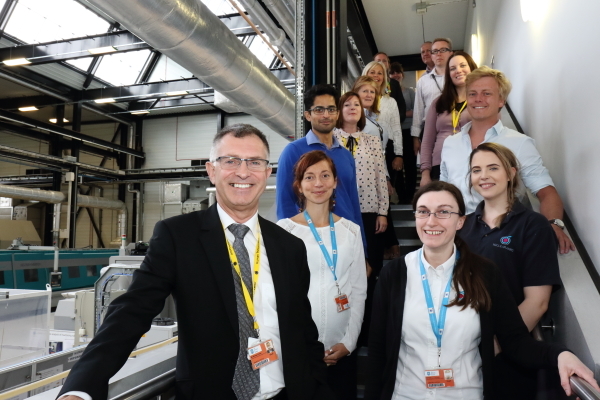 The Athena Swan application was prepared over the past year by a team from all parts of the Nuclear AMRC, led by technology researcher Dr Kathryn Jackson. Download the Nuclear AMRC’s Athena Swan application (3.8MB pdf).